Lemon Bars…or is that Lemon Squares? 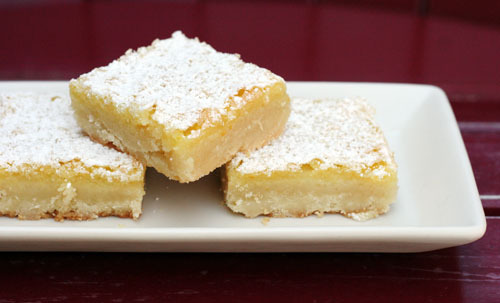 Today I’m sharing my recipe for lemon bars. Or are they lemon squares? Whatever they’re called, they are lemonicious! I have no clue where I found this recipe. It was in my recipe box without any attribution. When that happens, it normally means I merged a few recipes together. If I have, in fact, stolen this recipe from someone, well, my sincerest apologies! Just let me know and I’ll throw your name on there lickity split! I made lemon bars for St. Patrick’s Day with lemon juice from the little squeezie lemon juice thingy in my fridge. No fresh lemons that day – so no fresh lemon juice or zest. When I made them again for this post, I used Meyer lemons and zest. I’ve gotta be honest…the St. Patrick’s Day version was better! The lemon taste was stronger and more tart, which added depth of flavor. Meyer lemons are great because they seem to sweeten up nicely, but for lemon bars I think they ended up being a little too sweet and mild/flat tasting. Take your pick…I’m sure it’s a matter of personal preference! Why is my recipe so good? I don’t know, it just is. The shortbread and lemon layers meld together nicely and the texture is just right. This is a non-chocolate dessert I can get behind! From Jane Maynard at This Week for Dinner”¦maybe! Preheat to 350 degrees F.
Mix crust together and press into bottom of 9X13 pan. Bake for 10 mins. Mix top ingredients and pour over baked crust. Bake for 25 mins more. Remove from oven and sprinkle with powdered sugar. Let set and cut into squares. Makes about a million squares. They look so good! You know, I’ve never made lemon bars I don’t know why because I know I’d love them! I’m going to try this using my favorite product True Lemon in the pouches and splenda. Thank you for the recipe. These look amazing. So good I might go bake them right now:) Thanks Jane! These look delish. I dont know why I dont make them more often but I love them. I will def have to use your recipe! I am definitely going to make these! I have a huge family reuinion/potluck to attend on Saturday and I think this will be the perfect spring dessert for sharing. These look SO good! Perfect for the baby shower I’m attending at the end of the month. I am making these tonight for a bbq, can’t wait to try them. These were WICKED good. Though I’m not sure which I liked better – the green ones, or the yellow ones. They were both delicious. I hope Amanda sees this recipe! Lemon Bars are her absolute favorite! Gram used to make them (from a box) all the time. Matter of fact I think Brian loves them too! I’m making these this weekend!